I'm loving this little snowman. He is just so much fun. 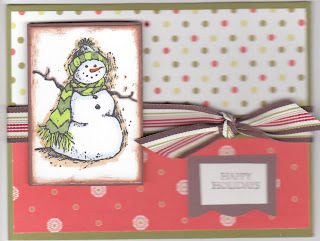 This is a simple quick card to make, but I think makes a great impression!! Thank you for coming over and come check me out again! hola! you have been a stamping fool lately!! all of your cards are great--i especially like this one and the turkey one--gobble gobble!